17 years ago the Spice Girls were featured on the front cover of "the fashion Bible" in support of their campy-fun flick, Spice World, and upcoming world tour, and it was all around stylish n' spicy. Black nail polish on short nails, highlights, and a grumpy looking Posh are things that will always give me the warm and fuzzies about the late '90s, and it's all on this one cover. Oh, and smiles, natural smiles and looks! People didn't go overboard with the photoshopping back then, and it's why the ladies Spice are glowing and looking like your best gal pals on this cover. They just look approachable, their looks look achievable...if that makes any sense. Now the article accompanying these gorgeous shots...sheesh. Patronizing he-man woman hating is what pop culture journalism was like back in 1998, I see. Okay, I know that not everyone was enraptured with the Spice Girls like I was at 12, but the shade is truly thick and salty in this piece (Emma Bunton's hair is described as "lank"; Mel C is a "screamer" not a singer, and is apparently "not the brightest bulb"; they are compared to The Village People...lordy). You can read and eye-roll the day away to the full interview here, and the bonus is that once you click that link you actually go back to 1998 as the article is posted at a Tripod website. I'm not making this up. I actually have a vivid memory of buying this issue at my favorite Half-Price Books store back in the day when I was collecting Spice Girls memorabilia left and right, and I'm actually proud to say that its the only Vogue magazine I have ever purchased. Don't get it twisted, I'm not a total country mouse on fashion culture as I know that the publication's best days were when Diana Vreeland was at the helm, and I'm in agreement that they need to show more (diverse) models than B-List celebrities or dead celebrities on the covers (looking at you Vanity Fair and your 10 billion Marilyn Monroe covers...), but I'm just not chic or rich enough (or White enough) to really lose myself into the pages, and this is coming from someone who loves fashion and knows how to run holes in my wallet whenever I go shopping. Vogue just doesn't speak to me, and this time was the one time it truly did. This is why I like this cover. Like I said, it's an approachable cover, and I guess that's why it's "not stylish enough". 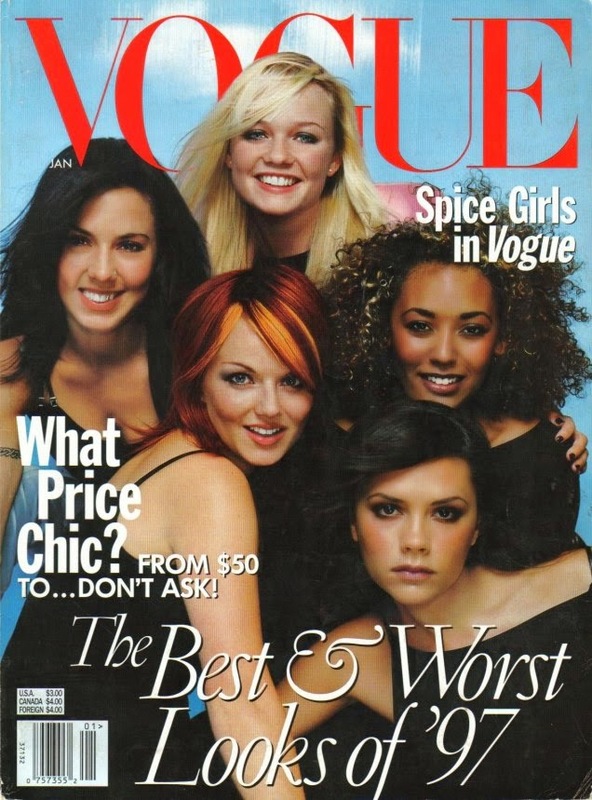 We don't get to see a collective of ladies get praise like this, or see a diverse roster like the Spice Girls on a magazine cover, therefore this Vogue cover is legendary to me, as it introduced me to the magazine and feminine beauty in the best way possible 17 years ago. Hi Ci Ya Hold Tight, y'all!